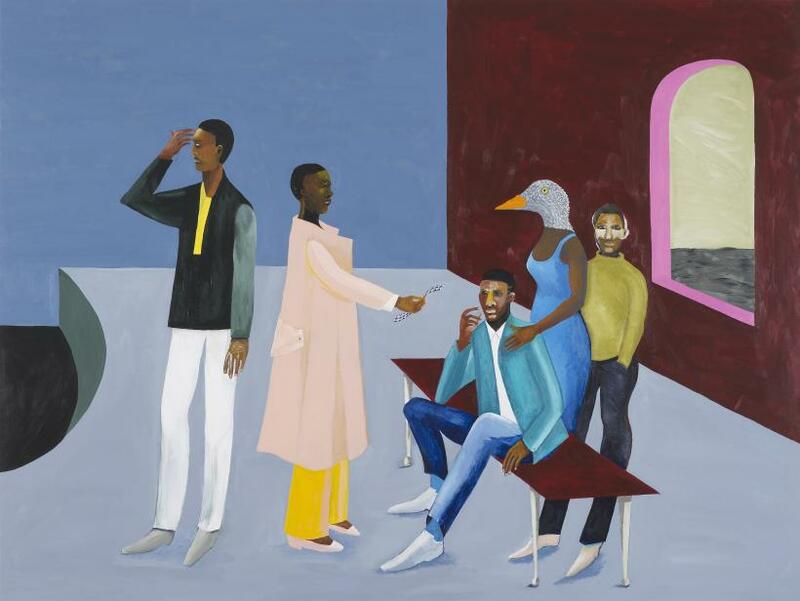 Opening the day following the inauguration of President Trump, it would have seemed inappropriate if Modern Art Oxford director Paul Hobson hadn’t addressed the sense of urgency and lamentable timeliness surrounding Lubaina Himid’s exhibition. 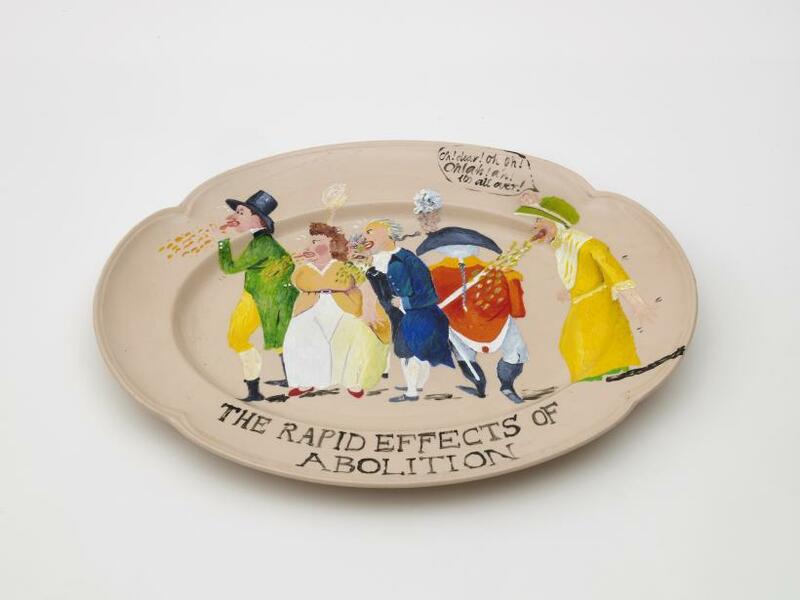 ‘We are curating a new political era,’ Hobson said at the press view, defining the era we now find ourselves in as one of discourse around racial prejudices. 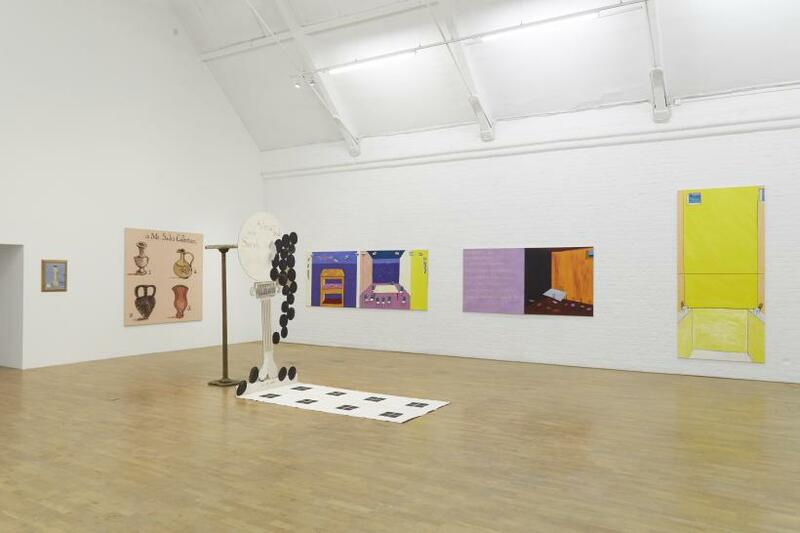 The show comes at a significant moment, yet it must be remembered that as an artist, curator and self-described ‘political strategist,’ Himid has worked tirelessly throughout her practice over the last 30 years to highlight the implicit and systemic racial exclusion within British art institutions and society. This resistant action is a peaceful one, a resilient process of cutting, editing and reclaiming the western canon of art history. The exhibition opens with the glorious ‘Freedom and Change,’ a reworking of Picasso’s famous ‘Two Women Running on the Beach (The Race)’. 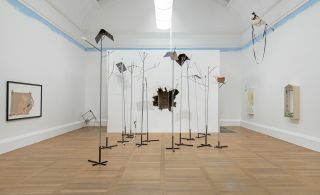 The women, their black skin roughly spray-painted and their clothes assembled from torn paper, spill out from their fabric hanging, pulled by the cardboard animals they walk. 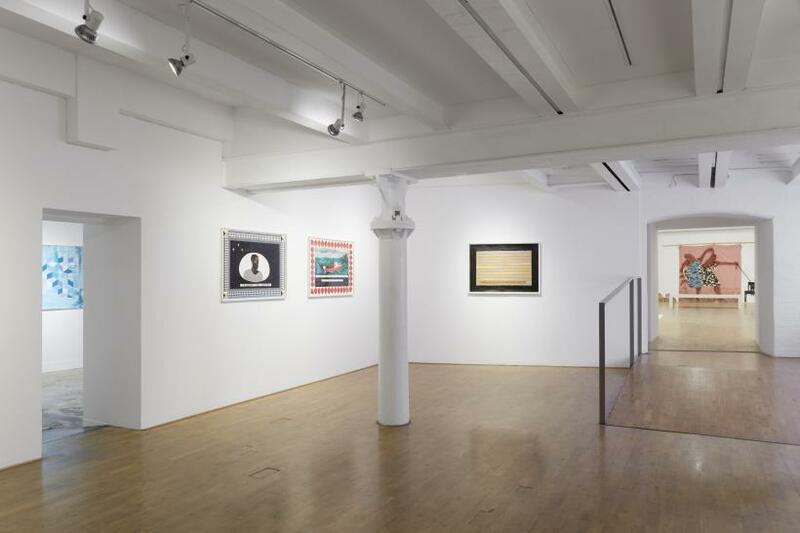 They cannot be contained by their art world setting. 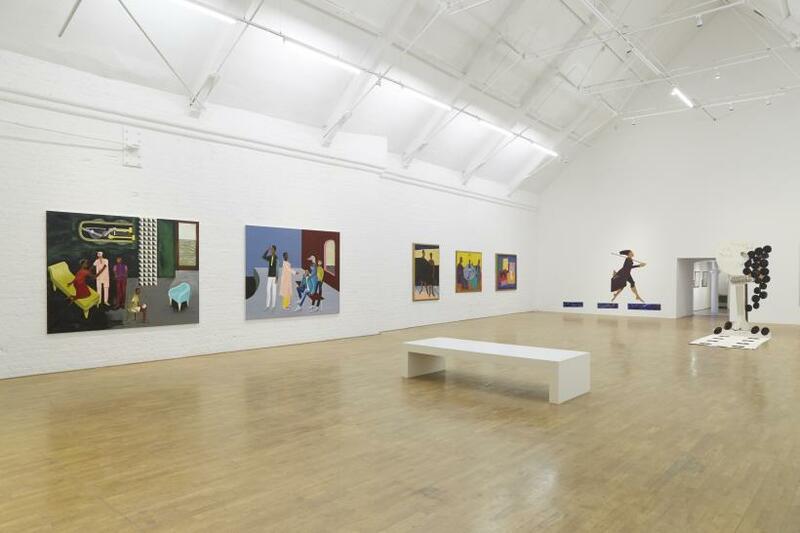 Like so many of Himid’s paintings here, ‘Freedom and Change’ incorporates some of her early training as a set designer. Theatricality and performance are integral to the notion of political change for her. Many of her painted subjects display fantastical qualities in their form, such as a bird’s head on a human body, or are doused in a kind of otherworldly coloured light. Sometimes this is beautiful, often it conjures up a sense of unease and horror. 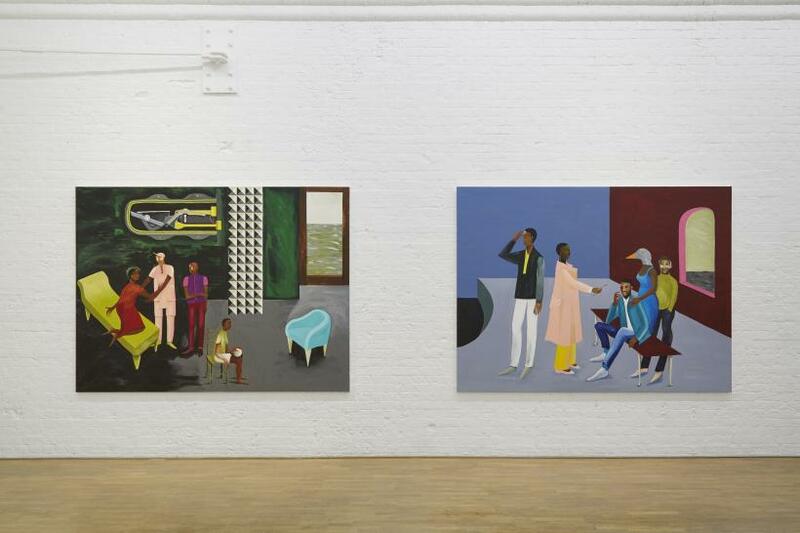 Himid’s paintings fill the main gallery space at Modern Art Oxford, and while there is much to discover within and between them, it is the other series of works on show here that require a closer look. 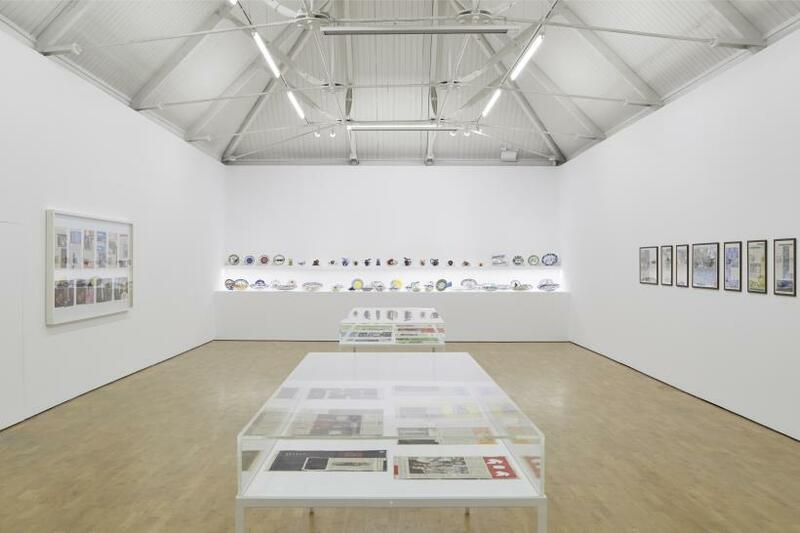 The second gallery displays some of Himid’s kangas – everyday cotton garments long produced and worn by women in East Africa. The artist is drawn to how clothing and pattern can become an unspoken female language, a ‘secret and yet visible’ way of communicating between women. 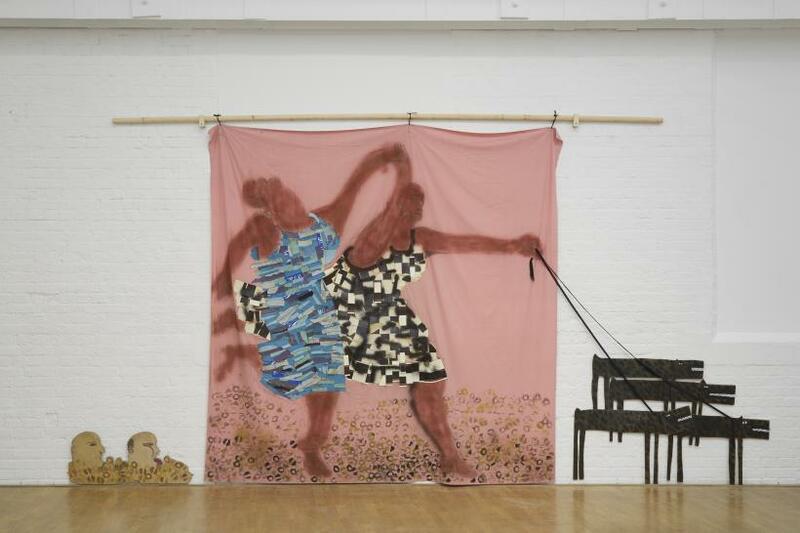 Swahili sayings traditionally are incorporated into the fabric designs, yet Himid’s kangas feature slogans taken from the abolition and civil rights movements and adapted by her. ‘Have courage in the crisis / set yourself free’ resonates particularly now. 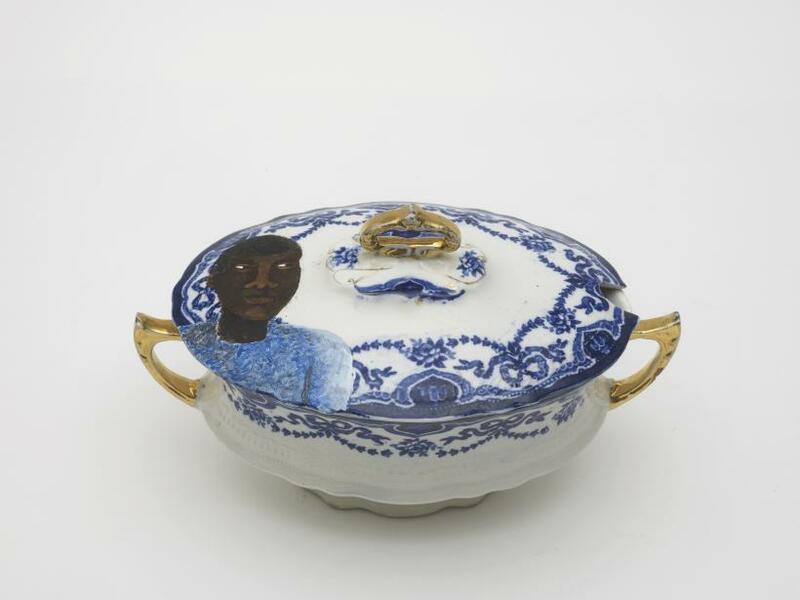 The final gallery is dominated by ‘Negative Positives’, an ongoing series of work in which the artist has highlighted the subliminal racist connotations of the portrayal of black people in the British media. 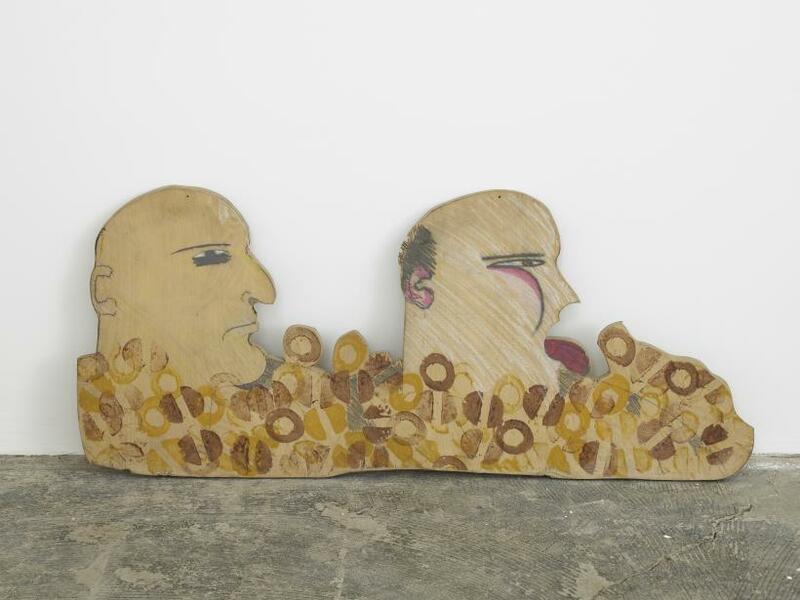 Since 2007, Himid has subverted pages of The Guardian through pattern, calling to attention the simultaneous visibility and invisibility of black people’s lives. It is a shocking visual research into the everyday profiling that continues in plain sight and, like much of the work on show here, demands long and quiet contemplation. 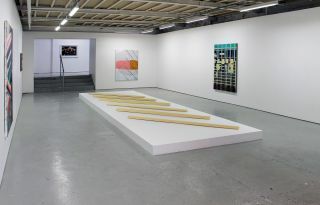 The artist is adamant that her subjects are not commemorated in her work, but used as ‘an encouraging incentive for everyone committed to restoring the balance, revealing the truths and continuing the dialogues.’ This is the kind of work that will carry us through this new political era.